Welcome to Day 1 of the DeNami Design Fall/Winter Release Sneak Peeks!! 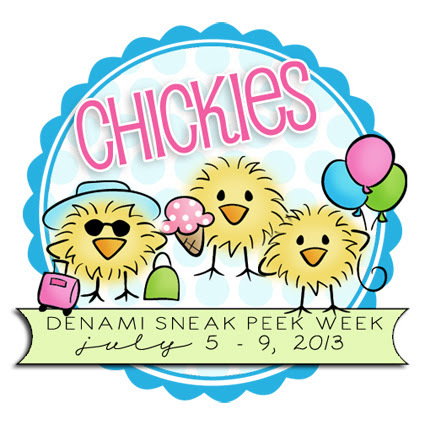 Today brand-new DT Member Pattie Goldman, veteran DeNami DT member Lisa Petrella, and I are giving you sneak peeks of brand-new DeNami stamps about to be released in the always-fun CHICKIES category! Be sure to read all the way to the end of this post for details on a great giveaway :D.
Do the sweet DeNami chickies totally tickle your fancy? If so, you are positively in luck! The new release includes brand-new chickie stamps for summer activities, various sports, girlfriends, camping, gardening, Halloween, and Christmas. Whew!! That's quite a few! Are you ready to take a peek at what's in store for the chickie category? Let's get started! Now how about taking a gander at a pair of stamps that are perfect for the rockers in your life? This card shows off the new Rock Band Chickies stamp and the fun You Rock! sentiment. I added some chipboard alphabet stickers to spell out "dude," the perfect touch for a teenager-bound card. A bit of Black Curly Loops washi tape and some red DeNami cardstock round out my design. Next I'm shifting gears to autumn and Halloween! For this creation, I paired the brand-new Pumpkin Patch Chickies stamp with the cling-style Trick or Treat sentiment stamp. Aren't those chickies sweet? I made my background from an assortment of DeNami washi tapes: Lime/White Dots, Black Curly Loops, and Orange Stripes. I also used some Desert Orange cardstock and black baker's twine from the DeNami store. And finally, let's have a little Christmas in July! Don't you just love those sweet little Caroling Chickies? And I am completely captivated by the tiny sentiments in the brand-new Christmas Greetings petit four stamp sets!!! This is a set that I have been waiting ever so patiently for :D. They are just the perfect size for Christmas tags, and that's exactly how I put them to use. The DeNami To and From stamps are perfect for completing these festive tags. I also used some red DeNami cardstock and red baker's twine from the DeNami store. All of the new stamps I used today in my sneak peek projects will go live in the DeNami online store on July 10 at 9am PST. OK, are you still with me? Thanks for hanging in there through this long post. :-) I mentioned a giveaway way back at the beginning of this post. DeNami Design is giving away two gift certificates today! 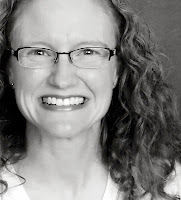 Be sure to leave a comment here on my blog post, Pattie's chickie sneak peek blog post, and Lisa's sneak peek blog post, too. 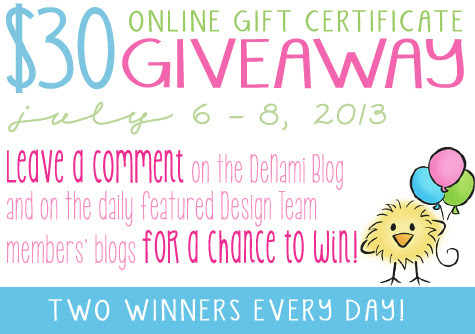 Then head over to the DeNami Design blog and leave a comment there, too, for another way to win today! I'm so glad that you dropped in to check out some of the new chickie stamps in the DeNami Design Fall/Winter Release! Be sure to tune into the DeNami blog tomorrow for more sneak peeks and giveaways. These are all just adorable Emily! You did a perfect job showing off the new chickies!! I think I like the Pumpkin Patch chickies the best! THAT's a LOT of chickies, Emily! My FAV is the campfire scene! Just Adorable! very lovely new chickies! Great cards too! Such adorable creations for those adorable Chickies, Emily!!!! Emily cute, cute, cute and I am in love with the sweet camping chickies! Eeek! Emily, you rocked the chickies! They are all so adorable! Each creation is fabulous in it's own way! Love your cards and the camping one is also my favorite. Thank you so much for sharing your creativity. Adorable projects--love the camping chickies! These are all adorable! I love the pumpkin one with the stripes! I have a hard time with tiny images, I like them to be the centerpeice of my cards. BUT love the cute DeNami stamps so it is great to see how others use them. THANKS! Adorable cards - really lovin' on the rock band chickies. Thanks for sharing with us. These are all extremely cute. But what chickie isn't? I am truly a chickaholic. I have two favorites in this collection, trick. Or treat and Christmas chickies. The others are adorable, but i would get the most use out of these. These chicks always make me smile and you have showcased them fabulously!! Cute chicks! Wow! A lot of new ones! But those pumpkin ones are just sweet! A post FULL of cuteness emily!! LOVE the camping chickies, reminds me of my childhood!! These are some great new stamps! I love the rock band chickies and the caroling chickies! Wonderful projects, by the way! Each card was cuter than the last but, my favorite was the rock band chicks! Super cute! Great cards! I love all the new chickies! Thanks for sharing! I always love your work, Emily, & today is no exception! The Halloween & Christmas projects are my favorites--just too cute! I've gotta get my hands on some of those Washi tapes, too! These new stamps are precious! When i saw the camping chickies, i thought of how happy they must make you, Miss Camper! Those chickies are super cute! Really cute chickie cards. Love the carolers. Oh my! Your chickie cards are so stinkin cute! Love them all. Love the camping chickies, and your background paper is perfect. I love your chickie cards. Just so cute! The campers are darling and so is the paper. I also love the carolers. Well, they're all just so fun and adorable. As always, your creations are FABULOUS! I squealed when I saw the caroling chickies!! Sooooo in love with that image! These are really cute! I especially love the rocker chickies. Gotta have them! I love the new stamps and can't wait for their release on July 10th. Your Card and tags are just precious. I love all your creations with the chickies! They are soooo stinkin cute! I really love your "Dude you rock" card. The chickies playing instruments is so cute. I also like your tags. Very festive! You should enter your creations into my anything goes funday Friday challenge on my blog below! TFS! Adorable cards. Love the Christmas Choir - so cute. great job and fabulous color work. Darling cards and tags Emily! The Pumpkin Patch Chickies are a favorite... I love Halloween! Wow are these ever cute! I love the camping ones too - they remind me of your family. Darling stuff her Emzi!!! Hugz! All of your projects are really wonderful. The chickies in the new release are so cute. Those are all amazing cards! love the chickies camping camp fire! adorable. Oh they all are just adorable! You can't have enough chickies is what I think! Way to totally ROCK these new chickie images, Emily!!! I absolutely LOVE all of your sneak peek creations!!!! Every little detail is so well thought out and perfectly executed!!! Awesome work!! The chickies are so cute. I don't know which I like the bgest, maybe the Christmas tag. Wow you were reakkt busy! I love the little tags, they are adorable. All your holiday cards make me want more chickies! Thanks for the chance to win some great product! I just love those little chickies.. They make me smile. Adorable little chickies...too SWEET! Love that little campfire scene! All of these are really fun! I think I may have to break down and buy a few of them! Sweet images - they always make me smile and you do the greatest things with them!!! Hugz!